We love pizza night at our house. And they have been getting more frequent these days because we are so busy! My boys always beg me to make homemade pizza instead of ordering out. But when we do get a pizza, we love the take and bake pizzas. Our family loves the cinnamon wheel from Papa Murphy’s. And the last time we got it I thought to myself, I can totally make this! And I can make it even better. 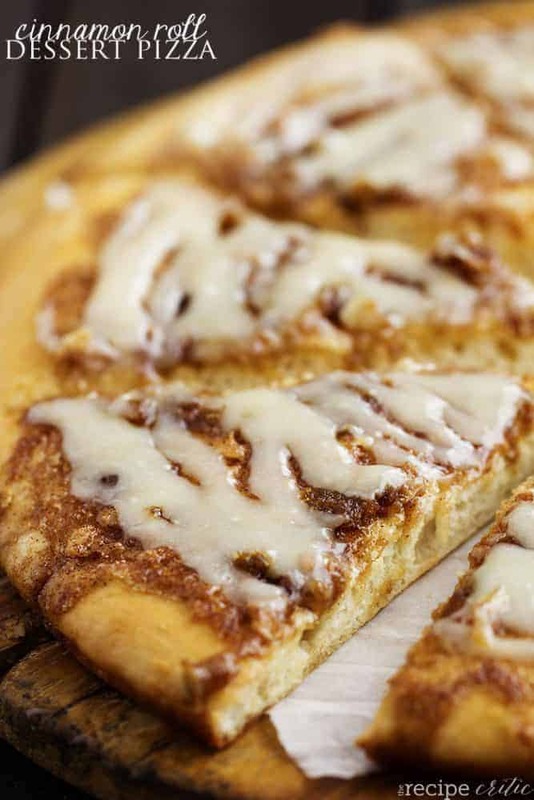 And before I knew it, the best cinnamon roll dessert pizza was born. It all starts with my quick and easy pizza dough. This is my favorite dough recipe in the entire world. I use it for several recipes on the blog. I love it because it only requires 20 minutes of rest time, so you can have your pizza in and out of the oven in no time at all! The dough is perfect. Soft and the perfect pizza consistency. It bakes perfectly every time! 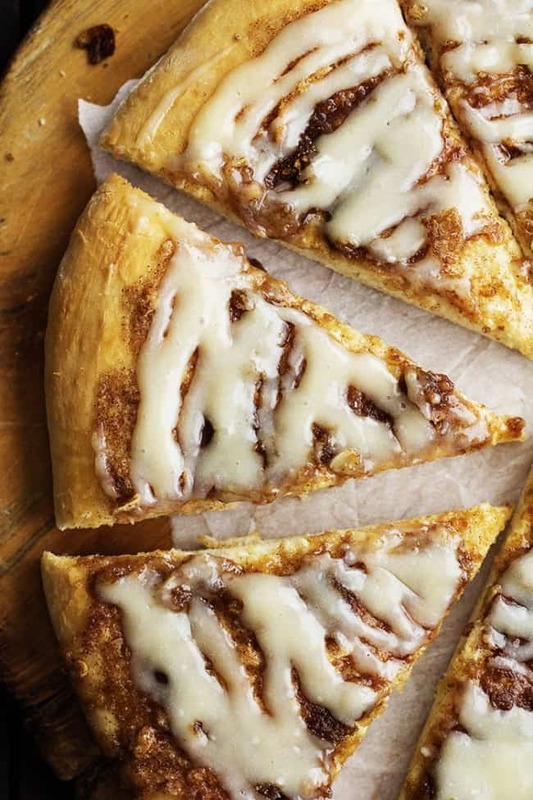 Everything about this dessert pizza turned out fantastic! Even better then our favorite pizza. 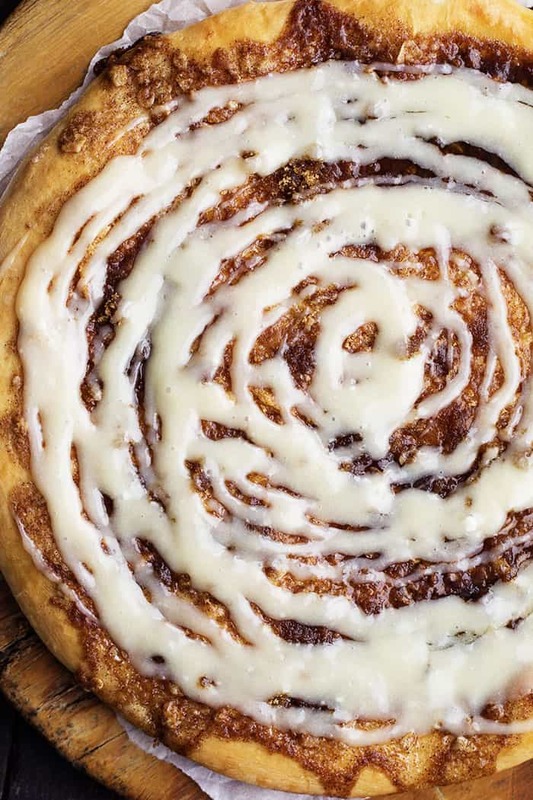 But I think you will agree that the best part is the cream cheese glaze on top! Two of the worlds greatest things ever combine to bring you this amazing dessert pizza that your family will love! This looks ridiculously good and addicting, wow! Did you divide your dough in half to make it or use the full amount? Thanks for sharing your recipe! I divided them in half and cooked them on smaller pizza pans. Have you ever doubled the crust? I made this for brunch today, and it was a huge hit! I set aside about 1/4 of the dough and used it to make some of your Parmesan Garlic Bites. Thanks for a fun recipe that I will make again. Do you drizzle when cooled? I thought the bbq homemade pizza was awesome! Then I took this out of the oven and it brought the meal to a new level! I made this exactly to the recipe and it was spot on. The oats in the filling really gave it the texture that other recipes don’t have. Thanks for giving me the prefect dessert pizza recipe!!! I have made the same thing with all the ingredients, Taste of the pizza is awesome. I don’t know what I did wrong but the butter made leaked all over my oven and sat my fire alarm off. My crust was also so tough we couldn’t eat it. Not sure what happened! Oh no! I am sorry it didn’t turn out for you! We loved this recipe. I would probably reduce the butter if you had that issue. I thought you mentioned a pre made pizza dough. I’m not able to touch live yeast, so a pre made dough would be great if suggested. Please comment. Thank you. Oh my gosh AMAZING!! I had the Papa Murphy’s version while travelling in the USA recently and craved it once we returned to Canada… unfortunately Papa Murphy’s isnt really a staple here… but google led me to this recipe and boy am I glad! Ive made it twice already and it has been delectable each time! YUMM! Thank you!! I really enjoyed making this dessert, and it came out nicely first try. Thank you very much!! I flopped this, but it has potential. I needed to split the dough and topping in half for my 12” circle pizza pan. I had a lake of butter and topping in the middle of my dessert, and the crust rose beautifully but was too thick. I spooned off the extra topping and salvaged it. Live and learn…I’ll try again and I’m sure I’ll get two 12” pizzas out of this.